To say that the Edmonton Oilers have struggled this season would be an understatement, yet, unfortunately, it is a sentiment that has been echoed many times before. In a season marred by injuries, inconsistency, and, at times, a lack of compete level, the Oilers have once again shown the hockey world that they simply are not ready to legitimately compete at the NHL level. While Edmonton’s forward core has been ravaged by the injury bug, there has in fact been improvement this year, primarily so due to the arrival of Connor McDavid. Yet, with that being said, the fact that a 19 year-old has been the Oilers best player despite missing a large portion of the season is a problem in and of itself. In goal, Cam Talbot has enjoyed a tremendous season despite being shelled on a nightly basis, while top goaltending prospect Laurent Brossoit has also been sharp in the few games in which he has played. Meanwhile, on defense, it has been yet another hectic season. Once again amongst the Top-5 in Goals Against, the Oilers defense core can best be defined as porous. Missing their best defender in Oscar Klefbom for an extended period of time has not only hurt, but it has resulted in a revolving door of replacements, ranging from Griffin Reinhart and Nikita Nikitin to Adam Pardy and Adam Clendening. The lone bright spot being the play of Brandon Davidson. But what about Darnell Nurse? In his first full season in the NHL, Nurse has shown flashes of promise, but has yet to truly establish an identity at hockey’s highest level. This is a question I have commonly begun to ask myself while assessing Oilers games this season. Nurse has played a rugged style in his first NHL season, and has become accustomed to dropping the gloves if the situation permits. However, he has followed these instances with periods of flashy, impressive offensive play. Will Nurse evolve into a primarily offensive defenseman, as he had shown in his OHL days with the Sault Ste. Marie Greyhounds where he scored at a 0.60 points per game pace? Or, will Nurse instead develop into a shut-down, defense first defenseman, using his 6’4″, 210 pound frame to physically dominate opposing forwards? Although he entered the 2015-16 NHL season with two games played, Nurse is undoubtedly a rookie, yet has been logging on average approximately 20 minutes of ice-time per game, not exactly an easy introduction to the NHL, especially for a Western Conference defenseman. Based on his stellar junior career, it is abundantly clear that Nurse retains an offensive edge, yet it is one which we have yet to see on a regular basis with the Oilers. With great speed and acceleration, it should come as no surprise to learn that he scored 134 points over 221 career games with the Greyhounds, 36 of which were goals, while he also netted four points in four AHL playoff games in 2014-15. However, offense has been much harder to come by for Nurse in his short time in the NHL, as he has thus far failed to serve as a true threat on the Oilers blue-line despite showing flashes of brilliance. While the Oilers won’t necessarily be looking for elite offensive production from their back-end considering the strength of their forwards up-front, developing an offensively gifted defenseman in Nurse certainly wouldn’t hurt, as it would provide Edmonton with greater depth in terms of forms of attack. In the long-run however, it would appear safe to assume that Nurse will never become an Erik Karlsson type of offensive threat. Once fully developed, Nurse could certainly net somewhere in the range of 20-30 points per season, a total which would compliment an offensively laden Oilers roster. Standing 6’4″, 210 pounds, Nurse is a strong young defender who makes the most of his incredible size. His true strength when defending is the use of his size and strength to physically dominate opposing forwards, pushing them to the boards in his own zone as well as away from the front of the net. In tandem with Nurse’s defensive strength is an elite mobility level which allows him to stick with the more talented players he faces in his own zone. Where a player such as Sidney Crosby or Matt Duchene would shake the typical big-bodied defender, Nurse instead uses he quick feet to continually pressure opposing players, forcing additional strain which leads to an increased number of turnovers. In addition to these qualities, Nurse can be one of the meanest players in the NHL when the time strikes. One of his best assets is his willingness to mix it up with opposing players, no matter their experience or pre-existing pedigree. Earlier in the season, Nurse stood up for a teammate in a game against the Los Angeles Kings, fighting Milan Lucic despite his obvious edge in experience. 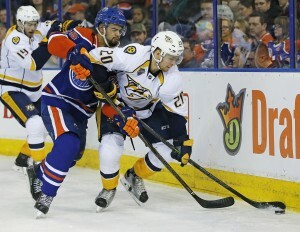 More recently, Nurse took exception to a hit placed upon team leader Matt Hendricks, dropping the gloves with Roman Polak of the San Jose Sharks in what was a one-sided bout. Nurse standing up for Hendricks, a guy who always does that for his teammates, is a welcome sight. It can become an attitude for the team. In short, Nurse is a combination of these two qualities, possessing a clear offensive upside alongside a much more developed defensive game. Currently logging major minutes on the Oilers blue-line, Nurse is heading the right direction in his development as an NHL defenseman, and can be best described as a future top-4 defense first defenseman with offensive upside. 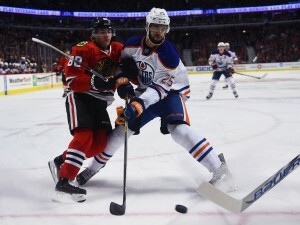 In looking for a comparison, I would argue Nurse could develop his game similar to Brent Seabrook of the Chicago Blackhawks, who is the ultimate definition of a complete defenseman. As we have seen, Nurse possesses all the skills necessary to become one of the League’s best. He has a clear offensive upside to his game which has yet to be fully applied at the NHL level, however this is undoubtedly an aspect of his game which will improve with time as his confidence continues to increase. On defense lies Nurse’s greatest strengths, where he is able to best utilize his unique combination of size, mobility and reach. At the moment, Nurse’s defensive game is relatively solid, although he would do well to focus on his consistency, which is also a quality which will improve with time. Playing major minutes in the NHL is no easy task, especially for a 21 year-old on one of the League’s worst teams, so to date it is safe to say that Nurse’s game is developing well at the NHL level. Given a few years to develop under the careful guidance of McLellan in what will hopefully be a winning environment will certainly serve Nurse well, as it will allow him to fully develop into the defender which the Oilers selected 7th overall in the 2013 NHL Entry Draft. While he is an unfinished product as of now, it is clear that Nurse retains the potential to be one of the NHL’s most complete defensemen. Although his defensive game is currently a step ahead of his offensive prowess, given time to develop, Nurse is poised to become one of the League’s top threats – at both ends of the ice.